When the story books are re-written, the increasing — but uncoordinated — coherence between the Brit Neo-Catastrophists and the American YDB team will make interesting study for students of science history. These two groups have no overlap but the facts are leading them to the same place. Ditto for the Holocene Impact Working group. WAS A GIANT COMET RESPONSIBLE FOR A NORTH AMERICAN CATASTROPHE IN 11,000 BC? 13,000 years ago the Earth was struck by thousands of Tunguska-sized cometary fragments over the course of an hour, leading to a dramatic cooling of the planet, according to astronomer Professor Bill Napier of the Cardiff University Astrobiology Centre. He presents his new model in the journal Monthly Notices of the Royal Astronomical Society. The cooling, by as much as 8 degrees C, interrupted the warming which was occurring at the end of the last ice age and caused glaciers to readvance. Evidence has been found that this catastrophic change was associated with some extraordinary extraterrestrial event. The boundary is marked by the occurrence of a “black mat” layer a few centimeters thick found at many sites throughout the United States containing high levels of soot indicative of continental-scale wildfires, as well as microscopic hexagonal diamonds (nanodiamonds) which are produced by shocks and are only found in meteorites or impact craters. These findings led to the suggestion that the catastrophic changes of that time were caused by the impact of an asteroid or comet 4 km across on the Laurentide ice sheet, which at that time covered what would become Canada and the northern part of the United States. The cooling lasted over a thousand years, and its onset coincides with the rapid extinction of 35 genera of North American mammals, as well as the disruption of the Palaeoindian culture. The chief objection to the idea of a big impact is that the odds against the Earth being struck by an asteroid this large only 13,000 years ago are a thousand to one against. And the heat generated by the rising fireball would be limited by the curvature of the horizon and could not explain the continent-wide occurrence of wildfire. Professor Napier has now come up with an astronomical model which accounts for the major features of the catastrophe without involving such an improbable event. According to his model, the Earth ran into a dense trail of material from a large disintegrating comet. He points out that there is compelling evidence that such a comet entered the inner planetary system between 20,000 and 30,000 years ago and has been fragmenting ever since, giving rise to a number of closely related meteor streams and comoving asteroids known as the Taurid Complex. In the course of the giant comet’s disintegration, the environment of the interplanetary system would have been hazardous and the Earth would probably have run through at least one dense swarm of cometary material. The new model indicates that such an encounter would last for about an hour during which thousands of impacts would take place over continental dimensions, each releasing the energy of a megaton-class nuclear bomb, generating the extensive wildfires which took place at that time. The nanodiamonds at the extinction boundary would then be explained as having come in with the comet swarm. One recent meteorite is known which may have come from this giant comet progenitor: the Tagish Lake meteorite, which fell over Yukon Territory in January 2000. It has the highest abundance of nanodiamonds of any meteorite so far analyzed. 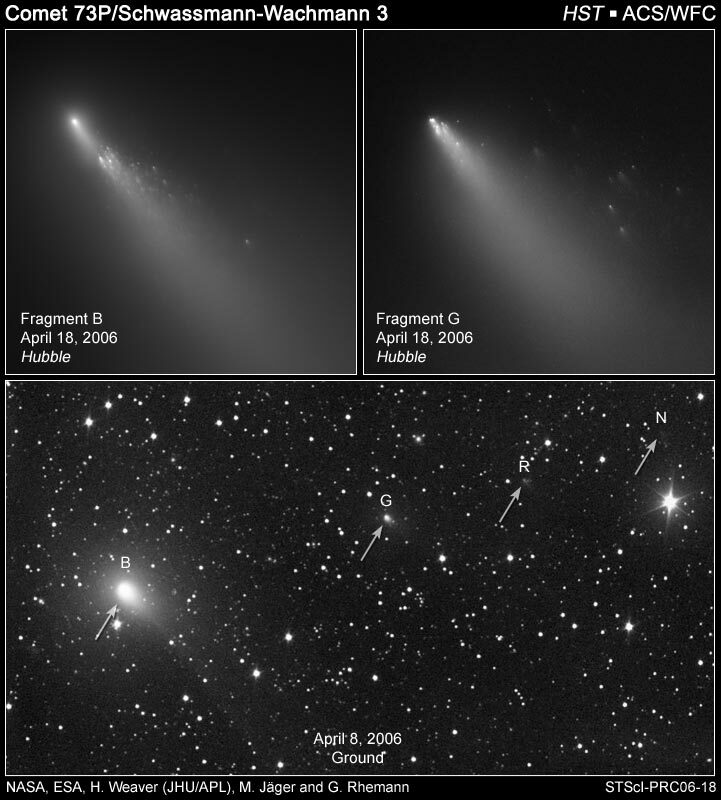 Professor Napier sums up his model: “A large comet has been disintegrating in the near-Earth environment for the past 20,000 to 30,000 years, and running into thousands of fragments from this comet is a much more likely event than a single large collision. It gives a convincing match to the major geophysical features at this boundary.